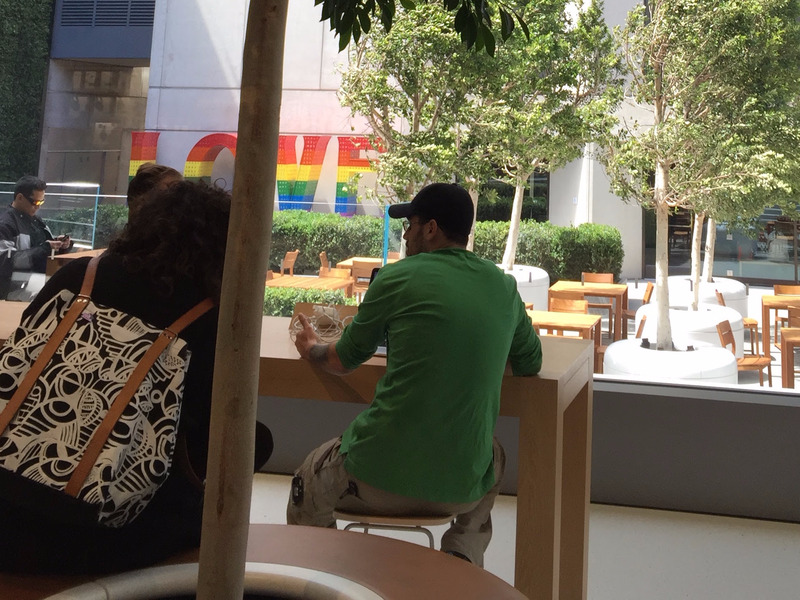 On nice days, Apple plans to open the 25-foot high doors at the back of its new “global flagship” store in San Francisco, letting customers bask in a sunny public plaza while they get their iPhones and Macs fixed. In the center of that plaza is a sculpture called “Love,” by San Francisco-based artist Laura Kimpton. You can’t miss it from Apple’s new “Genius Grove,” which is replacing the traditional Genius Bar. 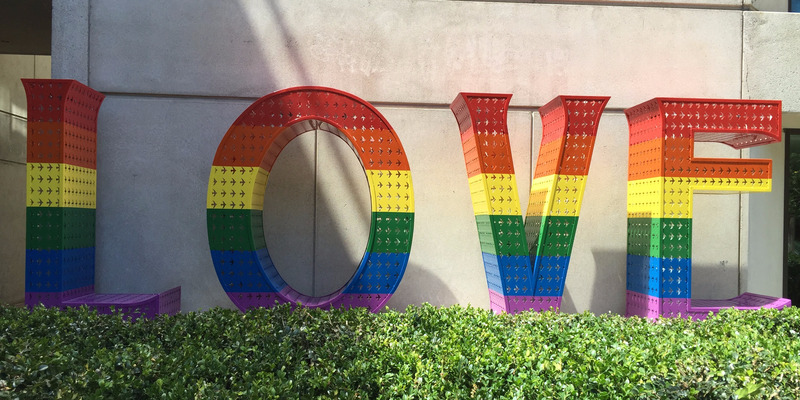 The 10-foot high rainbow letters really stick out. To any “burners” visiting the store the sculpture might look familiar — because Kimpton’s been making large word art at the annual Burning Man festival in Black Rock, Nevada, for years. “Apple and Hyatt are having conversations with me, so these very large organisations are no longer scared of Burning Man. It’s an art festival,” Kimpton told Business Insider. Here’s the story of how a piece of San Francisco outsider art found a place at Apple’s most important store in years. Kimpton first went to Burning Man, the multi-day desert festival known for its mix of artists, nudists and partiers, in 2002 and it blew her mind. “I thought that people at Burning Man would be mad at me that I reminded them of their mum. Instead it was the complete opposite. People were like ‘oh I’m so happy I saw MUM, I just decided to cut it back a little bit and not party so hard,'” Kimpton said. 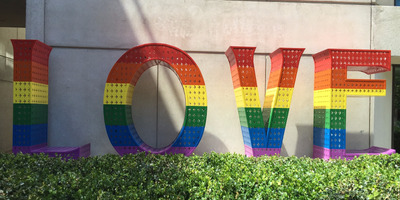 The next year she decided to make a giant “LOVE” sculpture — and although she thought it was a little “too obvious,” the rest of the Burners loved it. ” And now every time Burning Man is represented in a magazine they use the word ‘love,'” Kimpton said. 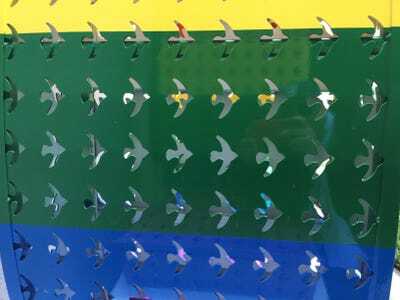 Since then, she’s done several commissions for large words sculptures — but the new rainbow-coloured Love at Union Square is arguably the most high-profile yet. “Big words are everywhere now, it’s so funny and I’ve been doing it for ten years. I’ve never seen it in a gallery situation, but big words are in every place on TV,” Kimpton said. Kif Leswing/Business InsiderThe view of Love from inside the San Francisco Apple Store. Those doors can open and people waiting for repairs can have them done in the courtyard. As the Apple press release about the Union Square store notes, Hyatt Hotels originally commissioned the piece. Apple says that a key part of of its new “global flagship” concept is that it integrates public spaces into the store. And the courtyard between the store and the Hyatt next door was perfect. Before Apple got involved, Hyatt came to Kimpton and wanted to commission some art from native San Francisco artists. 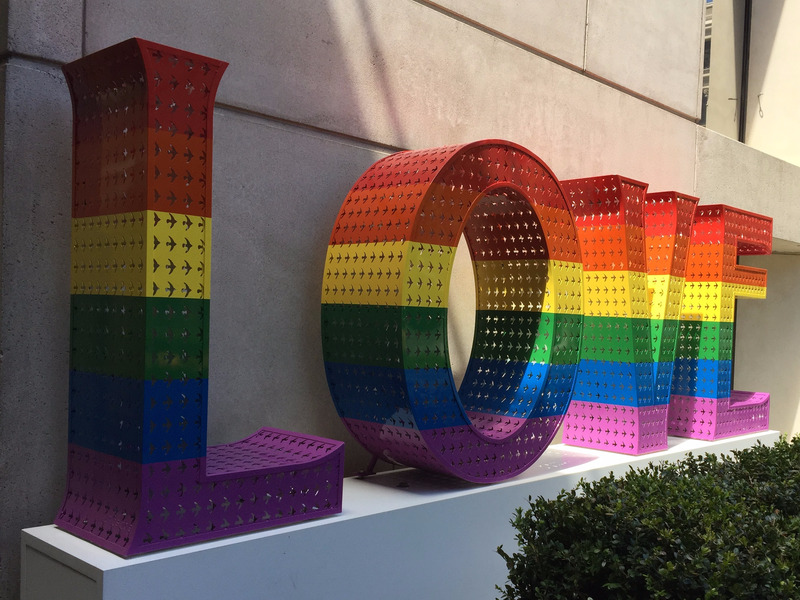 “We were talking about an idea and we’re like ‘wow, what if we did a rainbow Love’ in San Francisco,” Kimpton said. 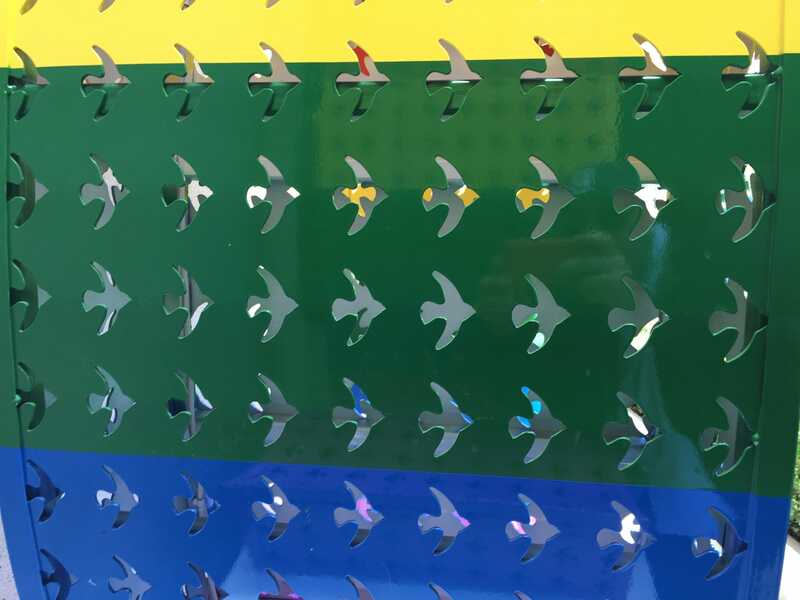 “We chose rainbow because San Francisco is the city of love, and acceptance of loving whomever you want to,” Kimpton said. Apple got involved in January — just months before the store officially opened this past May. Kimpton was thrilled, partially because she uses Apple products to help create her art. Kif Leswing/Business InsiderA close-up of the bird cutouts. The cutouts make the sculpture lighter, and according to Kimpton, they represent her father, who was the founder of Kimpton Hotels. Apple ended up paying a rush fee so that the 10-foot high sculpture would be done and installed by opening day. Even from inside the Apple Store, the Love sculpture is hard to miss. There’s a hedge around it so discourage people from climbing on the sculpture, but looking on Facebook and Instagram, people are already climbing over all of it — just like people did on the “playa,” or the desert where Burning Man takes place. You might be able to take the art out of Burning Man, but you can’t extricate the Burning Man from the art. “I’ve got to tell you, I knew people would go crazy over words, but I never knew they would go this crazy,” Kimpton said.